The World War One Memorial Fountain is an exact reproduction of the one destroyed beyond repair in a 2015 construction accident. Looking at it from the rear (facing courthouse) the main body has three rectangular sections stacked on top of each other above a single base. The lower section holds the inscription to World War One and a short but wider center section holds the dedication inscription. The upper section is the tallest and somewhat narrower than the lower section and topped with a concave bevel cap piece. Although the memorial is to World War One, this section listed the names of two men killed in the Civil War and one killed in World War One. One of those listed from the Civil War was Edwin Smith Sanders who is assumed to be a relative of the donor William Marsh Sanders. The relationship to the other two names is unclear. Incised near the top is an olive branch protruding from a circle with the year 1923. The inscriptions in the center and upper sections are in relief with the lower inscription incised. On either side of the main body are small fountains resting on carved scroll elements. From the front (facing street) the main body’s center section extends out to form a large fountain bowl with the inscription above the fountain. The highlight of the day was a speech by Haywood Sanders, an 83-year-old former slave who had served as the body servant to Edwin Smith Sanders during the Civil War. Reports from the time describe how Haywood entertained the crowd with stories of fighting that he witnessed with his master. After the ceremony, the sponsor William Marsh Sanders, a prominent local businessman invited the town to a barbecue under the shade of giant oak trees on his front lawn. 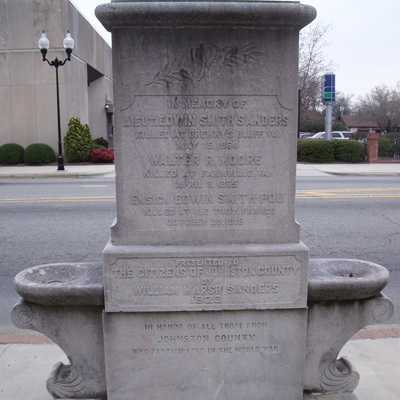 William Marsh Sanders gave the fountain to Johnston County and had it designed to provide water to humans, horses and birds during a time many farmers still rode horses and used horse-drawn vehicles. This helps explain its original location just a foot or so away from the street. The fountain was removed in June 2015 after it was badly damaged by a worker operating machinery. The top of the fountain was knocked off completely and the fountain broke off. Repairs failed and the pieces were shipped to a company that laser mapped every inch of the marble. It was then recreated with stone shipped in from Montana. There was no dedication when the replacement was installed in July 2016. The fountain is located in the center of a walkway directly in front of the Market Street side of the Johnston County courthouse, 207 E. Johnston Street, Smithfield, NC. The courthouse grounds also hold a World War One Doughboy statue, Veterans Memorial, a plaque commemorating General Lee's surrender at Appomattox, a memorial listing Johnston County war dead since World War Two, and a memorial flagpole to World War Two and Korean War dead. The memorial fountain stands on a paved walkway leading to the main entrance of the courthouse building.